After two months in Vietnam (see previous post), I went to China. While China had been on my list of places to visit, I didn’t want to go there alone. After reading several blogs and talking to fellow travelers who’d been there, I felt too overwhelmed to tackle such a challenging country alone, challenging only due to the language barrier and relative lack of English-speakers and foreign travelers outside of the big cities. While the prospect of visiting a less-traveled country sounded enticing, the idea of coping with travel logistics alone sounded daunting. Lucky for me, my friends Brett and Laura (UK), who’d I’d met and traveled with in Vietnam, invited me to join them to visit China. Now armed with travel buddies, I was ready to go. Per Wikipedia, China is the world’s most populous country (1.38 billion people) comprised of 56 officially-recognized distinct ethnic groups, of which the Han Chinese are the largest group. While Mandarin is the most common language, there are as many as 292 living languages spoken in China. Most Chinese (~80%) practice some form of Chinese folk religion based on Taoism and Confucianism with fewer being Buddhist (10-16%), Christian (2-4%) and Muslim (1-2%). With a land area of about 3.7 million sq mi (9.6 million sq km), China is similar in size to the U.S. However, China has the longest combined land border in the world (13,743 mi (22,117 km)) [compared to 7,515 mi in the U.S.] and borders 14 nations, more than any other country except Russia, which also borders 14. China is the world’s second-largest economy (just behind the U.S.) and the world’s largest exporter and second-largest importer of goods. China has the world’s largest standing army and second-largest defense budget (behind the U.S.), and is a member of the United Nations. Once ruled by various dynasties, China is now one of the world’s few remaining socialist states openly endorsing communism, having been described as communist and socialist, but also as authoritarian and corporatist, with heavy restrictions, most notably against free access to the Internet, freedom of the press, freedom of assembly, the right to have children, free formation of social organizations, and freedom of religion. China’s various landscapes are home to a high diversity of plants and animals and as such, China is designated as one of 17 “megadiverse” countries (countries, including the U.S. and Australia, that harbor the majority of Earth’s species and high numbers of endemic species). Unfortunately, a growing number of species are threatened by habitat destruction, pollution, and by use for traditional Chinese medicine. However, endangered wildlife is protected by Chinese law, and as of 2015, protected nature reserves covered about 18 percent of the country. It is also now illegal to eat an endangered species. While it appears that species and habitat are still inadequately protected overall, conservation efforts to protect some of China’s most charismatic megafauna and beautiful, unique landscapes are ongoing and will hopefully continue to increase. So, what did I do for nearly 2 months in China, including one week in Hong Kong? First, while still in Vietnam, I downloaded a VPN (virtual private network) app on my phone and tablet so I could freely access the Internet and keep in touch via social media. 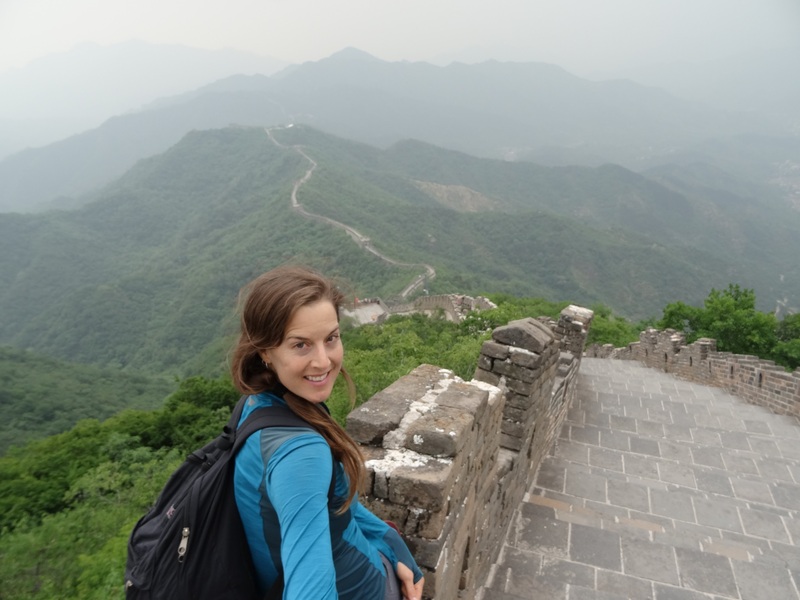 Once in China, I explored quaint ancient towns, visited beautiful temples and historic sites, speed past mountainous terrain and lush green rice fields via train, volunteered at an English school, walked on the world’s longest wall, hung out with friends, and trekked, of course, among snow-capped mountains and China’s legendary karst formations. From the border town of Lao Cai, Vietnam, Brett, Laura and I walked across a short bridge into the small city of Hekou in the Yunnan Province, thus crossing the border into southwest China. After navigating the easy entry process, we stepped out of the immigration office and were suddenly in China and completely surrounded by the Chinese language. While beautiful to look at, the Chinese characters offered absolutely zero hint as to the meaning of the words written on the street signs, the storefronts, the restaurant menus, the bus stop signs, etc…. And unlike other borders I’d crossed, the three of us were the only foreigners around. It was exciting but a bit overwhelming and I was relieved to be with friends. None of us spoke or read Chinese but at least we could figure things out together. While no one around us spoke English, people were very friendly and with the help of translation apps, a map, and hand gestures, locals helped us figured out which bus to take to get to the train station and then which train to take to get to our first designation, Kunming, also in the Yunnan Province. During the 6-hour train ride, I was seated in a different row than my friends. Fortunately, after discovering I spoke English, a very sweet 50-something Chinese woman changed seats with her friend to sit next to me to chat. She was an engineer and spoke enough English to proudly tell me that her daughter graduated from Columbia and now worked in New York City. She also taught her ancient father, whom I was sitting next to, to say “Welcome to China, I love you” which made everyone around us crack up. We chatted, shared snacks, laughed a lot, and she wrote my name in Chinese. It was a very welcoming introduction to China. After a two-night stopover in Kunming to get our bearings, we took a 5-hour train to Dali still in the Yunnan Province. While a relatively large city (population 652,000), we went to Dali primarily to visit the old town, an ancient walled city whose buildings were constructed in traditional Chinese style, which per Wikipedia includes tiled roofs and bricks, plaster or whitewashed walls, and the use of talismans and imagery painted on doorways and walls to ward off evil and encourage the flow of good fortune. The city is nestled between tall snow-covered mountains and Erhai Lake. Roaming the streets inside the ancient walls was interesting but the highlight of exploring the area was riding rented bicycles through the small traditional villages and past the fertile fields surrounding the lake. I enjoyed riding down the narrow side streets admiring the curved tile roofs and decorative doorways. While the area was crowded with tourists (almost entirely domestic) it was beautiful and fun to explore. After a few nights in Dali, we took a 3-hour train to Lijiang (population 1.2 million), another popular tourist city in the Yunnan Province. While Lijiang is also known for its ancient walled city, a UNESCO World Heritage Site, I thought it was overrun with souvenir and ice cream shops and lacked the charm of Dali’s old town. Fortunately, we were there primarily to access Tiger Leaping Gorge, a scenic canyon on the Jinsha River, a primary tributary of the upper Yangtze River. After a few nights in Lijiang, we took a 1.5-hour bus with fellow trekkers to the trailhead and started the roughly 13-mi (20-km), 2-day Tiger Leaping Gorge trek. While we shared the trail with many trekkers (mostly domestic), the steady stream of people thinned out considerably after the first few miles, allowing for a lovely, relaxing hike. The trail is situated high on the northern side of the gorge passing through quiet villages, terraced farmland, and pine forest all within view of Jade Dragon and Haba mountains. For much of first half of the trek, the view was obscured by tall, dense stands of bamboo. Thankfully, the view finally opened up, revealing the narrow, raging river thundering through the deep canyon below. While not the deepest canyon I’ve looked down into, sections of the deep gorge were spectacular and having a beer with Brett and Laura at our hostel’s rooftop deck overlooking the gorge after a day of trekking was fantastic. Once in Daocheng, we reunited with Charlie and Nell (UK) who we’d met in our hostel in Lijiang. Daocheng is a small town (population 30,000) fairly close to the Tibetan border. After bundling up against the cold, the five of us explored the town a bit, having a delicious dinner of local dishes including spicy goat cheese soup, which was a treat since cheese is not commonly eaten in China. The next day, we took a 2-hour minivan to Yading Nature Reserve. The road took us along tall mountains overlooking deep valleys and across barren wind-swept plateaus whose peaks were dotted with Buddhist stupas and prayer flags. There’d been no other foreigners on our bus or on the minivans to get to Yading and none at our hotel, but with the help of a translation app and a Chinese tourist who spoke a little English, the five of us got checked into our rooms then bundled up to explore the Reserve for a few hours before dark. It was cold and a little rainy but the views were amazing. After dinner, we huddled around the communal stove in the hotel lobby reminiscing about the trip to get to this remote reserve. It’d been a long journey but it was already apparent that it was well worth it. Per Landofsnow.com, the 520-sq mi (1344-sq km) Yading Nature Reserve was first introduced to the world when the famous American botanist and adventurer Joseph F. Rock published an article and photographs in National Geographic in 1928, saying “Where in all the world is to be found scenery comparable to that which awaits the explorer and photographer!” The area is most known for its three holy mountains, Chenrezig, Jambeyang, and Chanadorje which are worshipped as embodiments of the three Bodhisattvas of Mercy, Wisdom, and Power, respectively. Local Tibetans believe that the three holy mountains protect them and try to complete a circuit around Chenresig at least once a year. Thankfully by the time I woke up at 6am in next morning, it had stopped raining and the skies were mostly clear. Since Yading has an average elevation of well over 13,000 ft (4000 m), it was still darn cold. My friends opted to explore the Reserve at a more reasonable hour, so I spent the day trekking solo. I’d decided to try to complete the “small kora, a popular Tibetan Buddhist pilgrimage circuit around Chenresig (19,790 ft (6032 m)), the highest mountain in the Reserve. By about 8am, the electric carts shuttling people to various parts of the Reserve started operating so my solitude was broken by dozens of fellow visitors, all domestic. However, after trekking several miles further, I left the majority of the crowd behind and had the trail almost entirely to myself for the rest of the day. The trail went through a huge lush meadow, then climbed up and over two barren, windswept passes, the highest at 15,419 ft (4700 m), where colorful prayer flags flapped in the wind, then lead back down through another deep valley. It was amazing to be surrounded by tall, jagged, snow-covered mountains, watching the winds swirl the clouds around their peaks. It was absolutely stunning. From Yading, our 5-person crew returned to Daocheng for a night then took a 20-hour bus east to Chengdu, the capital of the Sichuan Province. The bus was also crowded (all locals), had uncomfortable seats, and stopped at disgusting bathrooms but at least smoking was prohibited onboard! Chendu. While there, we warmed up (now off the Tibetan plateau), relaxed, and had fun roaming the streets of this large, modern city (population 10+ million). We were there primarily to visit the Chengdu Research Base of Giant Panda Breeding, a conservation center where visitors can view endangered giant pandas and their distant cousins, red pandas, in a semi natural habitat. Unfortunately due to habitat destruction, giant pandas only live in scattered populations in the mountains of central China, mostly in Sichuan Province, but also in Gansu and Shaanxi Provinces. A recent census found only about 1,864 giant pandas in the wild. However, their numbers are increasing due to increasing forest protection and reforestation (http://www.iucnredlist.org). After a day of oohing and aahing at cute pandas, we had a few beers at our hostel then, along with our new friend, Vivian (China) who we’d met at our hostel, had a night out on the town. As some of the few foreigners at the dance club, we were befriended quickly by a table of local partygoers who insisted on supplying us with drinks all night long. It was a fun night of drinking and dancing. After five nights in Chengdu, we said farewell to Nell and Charlie, and Brett, Laura, and I took an 8-hour train northeast to Xi’an in central China’s Shaanxi Province. Xi’an is a large, modern city (population 8+ million) well known for its walled old town, for being the starting point of the Silk Road, and for the famous Terracotta Army. Per Wikipedia, the Terracotta Army is a collection of terracotta sculptures depicting the armies of Qin Shi Huang, the first Emperor of China, discovered in 1974 by local farmers. It is a form of funerary art buried with the emperor in 210–209 BC and whose purpose was to protect the emperor in his afterlife. The figures vary in height according to their roles, with the tallest being the generals. Per estimates in 2007, the three pits containing the Army held more than 8,000 soldiers, 130 chariots with 520 horses and 150 cavalry horses, the majority of which remained buried in the pits nearby Qin Shi Huang’s mausoleum. Other terracotta non-military figures were found in other pits, including officials, acrobats, strongmen and musicians. We spent a full day exploring the three pits containing the unearthed and partially unearthed figures. I have to admit I was sceptical that the exhibit wouldn’t live up to the hype, but I was pleasantly surprised. In fact, it was amazing to see the figures up close, each face and uniform slightly different from the next. And it was cool to watch as archaeologists continued excavating portions of the largest pit. The craftsmanship of the figures and their numbers was truly amazing. Another highlight of Xi’an was visiting it’s Muslim Quarter which covers several blocks and, per Wikipedia, is inhabited by over 20,000 Muslims. Walking the narrow streets crowded with locals and tourists was a feast for the eyes and the taste buds. While exploring we sampled some sweet and some savory treats then had mutton stew for dinner, apparently a very distinctive dish of Xi’an. Given the muslim influence, the food was different in content and flavor than the noodle soups and rice dishes we’d tried so far, making it extra tasty. After two nights in Xi’an, we took a 16-hour train south to Zhangjiajie City in the Hunan Province, the gateway to Zhangjiajie National Forest Park, China’s first national forest park. Per Wikipedia, the park, established in 1982, has an area of 11,900 ac (4,810 ha) and lies within the much larger Wulingyuan Scenic Area, a UNESCO World Heritage Site and Global Geopark. The most notable geographic features of the park are the pillar-like formations seen throughout. Although resembling limestone karst terrain, this area is not underlain by limestone, instead these formations are the result of many years of weathering due to expanding ice in the winter and plants growing in the cracks. Due to the moist weather year round, the foliage in the park is very dense. These formations are a distinct hallmark of Chinese landscape and can be found in many ancient Chinese paintings. Apparently, these formations from around China, including from Zhangjiajie, inspired the floating Hallelujah Mountains seen in the film Avatar. Hence the reference to the park among us foreigners as the Avatar park (along with our difficulty pronouncing Zhangjiajie). Armed with my multi day entry ticket, I explored the park daily for three days, walking up and down thousands (literally) of steep stone steps and along miles of stone walkways to view the spectacular scenery. The park was very crowded, mostly with domestic visitors, and the visitor areas were super touristy with souvenir shops, food stalls and eateries (including McDonald’s), and paid photographers temping you and your family to dress up in traditional costumes in front of amazing vistas. It was like being at Disneyland in the mountains or Yellowstone National Park in the summer. Fortunately, the park is only accessible by a shuttle bus so it’s not congested with cars, just fellow explorers. Despite the heavy congestion of people at the most popular and easily accessible viewpoints, it was fairly easy to escape the crowds by walking further from the trailhead and by getting around the park via the many stairways versus the aerial trams. I think I climbed five hundred thousand stairs over my 3 days of hiking around the park! OK, that may be an exaggeration, but only a slight one. However, the climb up through the lush forest along small streams and waterfalls was gorgeous and mostly peaceful, and at the top I was rewarded with views overlooking vast fields of tall, pillar formations of various sizes that appeared to be floating above the clouds, just like in the movie. After exploring the Avatar park, we took an overnight train further south to Guilin then took a short bus ride to Yangshuo (population 300,000) in southern China’s Guangxi Province. We spent a day on rented bicycles riding past Yanshuo’s famous dramatic karst peaks along the Li River path and in the evening explored the town. Yangshuo is very touristy and due to its popularity among foreign tourists, many locals speak English. However, it was quite charming and the surrounding landscape was beautiful. After two nights there, I said farewell to Brett and Laura. They’d decided to go to Hong Kong and I’d decided to stay in Yangshuo for a bit longer. It was strange to think about being solo again after traveling with them in Vietnam and China for the past 2 months! I’d wanted to stay in Yangshuo to volunteer at the Zhuo Yue English College that my friend Jose (Nicaragua), who’d I’d met in Vietnam, told me about. In exchange for a bed in the 4-bed dorm room and 2 meals per day, I would help students practice their English for 2 hours each evening and during meals in the cafeteria. The students ranged in age from 17 to 35 and were from all around China. They lived at the college and attended classes all day, four days week. The students I met spoke English at various levels. For the nightly sessions, the college staff provided discussion topics to help lead the conversation. The topic my first night was responsibility (i.e., what are your responsibilities to your family, your neighbors, to society?). We talked about individuals’ responsibilities in China compared to in the U.S. I’d thought that in Chinese culture, young families traditionally housed their aging parents to take care of them but learned from the students that this is true mostly in rural areas where houses tend to be larger but that in cities, where space is limited and expensive, parents who need assistance often live in assisted living homes paid for by their children resulting in added financial stress for the young family. We agreed that most of us have become detached from our neighbors and community, and blamed our general reluctance to put down our smartphones. On the lighter side, we talked about our favorite music (hip hop, of course!) and talked about our favorite TV shows (everyone loves Game of Thrones!). Needless to say, the evening sessions were interesting and fun. During the evening sessions, at mealtimes, and during a few games of ma jiang (a traditional Chinese dominos-like game), I learned about my new friends Allen, Jack, Alisa, Vinny, Mary, and others, about their lives, culture, and beliefs, and they learned about mine. We had fun and laughed a lot together. It was an excellent experience. After 8 days in Yangshuo, I took an overnight bus south to Shenzhen then the local subway across the border to Hong Kong, officially the Hong Kong Special Administrative Region, an autonomous territory of China. Per Wikipedia, Hong Kong is a small island (427 sq mi (1,106 sq km)) with a population of over 7.3 million people of various nationalities, ranking as the world’s fourth most densely populated sovereign state or territory. Many of my fellow travelers recommended visiting Hong Kong, saying it was a very clean, modern city where most of the locals spoke English and you could find familiar foods, most notably a good burger. (After weeks of noodle soups and rice dishes, food discussions often centered around the desire to have a good burger.) Even with those reviews, I had only a half-hearted desire to visit the big, modern city, especially after hiking in the splendor of the Avatar park and hanging out in quaint Yangshuo. Lucky for me, I’d arranged via Couchsurfing to stay with Alan, a Hong Kong native who was happy to host travelers at his home on Langtau, Hong Kong’s largest island. He was a wealth of information and hearing that I liked to hike, told me about the numerous hiking trails all over Hong Kong. It turns out that since most of Hong Kong is hilly and mountainous, the majority of the country, about 70%, is maintained as green space, of which about 40% is protected park land. So along with going to Victoria Peak to view the city’s famous night time skyline and exploring the crowded, fluorescent-lite market streets selling anything imaginable, I hiked along the coast, going through small fishing villages, and hiked the Dragon’s Back Trek along the ridges overlooking the islands of Hong Kong. I enjoyed Hong Kong so much, especially the more peaceful Langtau Island, that I ended up staying there for 5 days! From Hong Kong, I took an overnight train northeast to Hangzhou (population 9 million), the capital and most populous city of Zhejiang Province (about 109 mi, 177 km from Shanghai). I went to Hangzhou primarily to visit my friend Carla, who I’d met and traveled with for a few days in Vietnam. It was funny to be in China staying with Carla, who’s from Spain, and her roommates, Alba, also from Spain, and Tal from Israel, all of whom were attending Zhejiang University and learning Mandarin. Apparently many international students attend the university, which per Wikipedia, is one of China’s most prestigious. While my friends were in class, I relaxed in their apartment and explored the city and Hangzhou’s famous green tea fields. Carla also showed me around the city, taking me to a few of her favorite markets and restaurants. On a Friday night, the girls took me to a friend’s birthday party, where I met their friends who were from various countries including Italy, Spain, Mexico, and Russia, living in Hangzhou for work or to attend the university. I was in heaven drinking red wine sangria and munching on bruschetta with pesto. Later that night, we went dancing at a club frequently by locals, many of whom were African. I was surprised to see so many Africans in China. Per Wikipedia, once it officially became a Communist nation in 1949, China, like the Soviet Union and other Communist nations, recruited Africans to study in its universities in a bid to gain support among the emerging generation of third world political leaders. As a result of the large scholarships and substantial financial support, there was a huge influx of African students. By 2014 an estimated 500,000 Africans, Afro-Caribbeans, and African Americans were present in China, there to engage in the lucrative import and export business or as students or tourist, many of whom have settled in the port city of Guangzhou and Hangzhou. It was great to be in such an international city. After five nights in Hangzhou, I took a 4-hour bus southwest to Tangkou in Anhui Province, the gateway city to Mount Huangshan Scenic Area, a UNESCO World Heritage Site. Per Wikipedia, Mount Huangshan is a granite massif consisting of 36 separate peaks, rising above 6,000 ft (1,828 m). The area is well known for its scenery, sunsets, peculiarly-shaped granite peaks, Huangshan pine trees, hot springs, winter snow, and views of clouds touching the mountainsides for more than 200 days out of the year. Famous throughout Chinese artistic history, Huangshan represents the typical mountain in Chinese paintings. I spent a day exploring this beautiful park, which similar to Zhangjiajie National Forest Park, meant climbing up and down thousands (literally) of steep stone steps, many of which were carved into the mountainside. The park was very crowded, mostly with domestic visitors, but with fewer souvenir shops. Thankfully, it was again fairly easy to escape the crowds by walking further away from the easily accessible sites and by using the stairs instead of the trams to get around. And while the topography of the park was similar to that of the Avatar park, the views overlooking vast fields of tall, granite formations were stunning. After returning to Hangzhou for a night, I took a 3-hour train northeast to Suzhou in Jiangsu Province, about 62 mi (100 km) from Shanghai. It’s a large city (5.5 million) known for its canals, bridges, and gardens. Through Couchsurfing, I’d met and stayed with Alessandra (UK) who’d been living there for about 9 months teaching English. She was a wealth of information about the city and was great to hang out with. She took me out to try some local foods, including a soup she referred to as “savory soya soup” that was interesting, and slimy glutinous rice balls with black sesame or red bean paste filling that was delicious. She also took me to a great local market with beautiful produce and interesting food items for sale. While there, I bought six hard boiled eggs. I’d been buying hard boiled eggs, called tea eggs, regularly from all over China (and Vietnam) but these held a surprise. After taking a bite, I looked down at the partially eaten egg and noticed a very tiny claw sticking out of the other half the yolk. Oh damn! Tea eggs are made from unfertilized and fertilized eggs but up until then, I’d been lucky in buying only the unfertilized ones. I’m not judging anyone who likes eating fertilized eggs but I couldn’t do it. Perhaps I should have known given that these eggs were slightly more expensive than usual; more protein I guess. Ha! During my 4-day stay in Suzhou, I also walked around the city, particularly along its famous canals which were particularly beautiful at night with the city lights shining. From Suzhou, I took a high-speed train, my first in China, northwest to Beijing (population 21 million). Traveling at a top speed of 192 mi/hr (309 km/hr), the roughly 728 mi (1172 km) journey took less than 6 hours. Wow!! Per Wikipedia, Beijing, the nation’s political, cultural, and educational center, is the second largest Chinese city after Shanghai and the world’s third most populous city. Beijing also has one of the longest and busiest subway systems in the world. The day I arrived in Beijing, I reunited with Brett and Laura, who’d been there for several days already. It was great to see my travel partners again! During my 11 day stay in Beijing, I was fortunate to stay with new friends I’d met via Couch Surfing, staying with Gabriel (China) at his apartment in north Beijing for four nights then with Sujin (South Korea) in her apartment in northeast Beijing for six nights. It was great to talk to them and get the different perspectives from a native and a nonnative who’d been living in Beijing for several years. It was also interesting to stay at their apartments in the north and northeast residential areas of Beijing versus staying in super touristy central Beijing. Thankfully since Beijing’s subway system is extensive and signs are also in English, it was easy to get to all parts of the huge city. While in Beijing, I visited some of the main tourist sites like the Summer Palace, China Natural Museum, Tiananmen Square, Jingshan Park overlooking the Forbidden City, all interesting places but, as you can imagine, packed with people. I also went to the Panjiayuan Flea Market, Beijing’s biggest and best-known arts, crafts, and antiques market. Brett, Laura and I had a fun day walking up and down the endless aisles of interesting items ranging from pottery, masks, dishware, vases, furniture, jewelry (gold, silver, jade), prayer beads, etc… While in Beijing, I also reunited with Vivian (China), who’d I’d met and gone dancing with in Chengdu. I spent an evening with her and her friend, Michelle (China), both of whom lived in Beijing, chatting away as they showed me around the popular Shichahai Lake area. On another night, the three of us girls and Sujin, had a night on the town. I felt very underdressed at the up-scale, LA-style dance club they took me to but the music was kicking and we had a super fun night shaking our grove thangs. I also visited some great food streets and hutongs per Gabriel and Sujin’s suggestions. The food streets were packed with tourists, mostly domestic, who, like me, came to see and maybe taste some of the strange foods (i.e., starfish, scorpion, seahorse, etc…on a stick) offered by the street vendors. I walked up and down the blocks several times to get second and sometimes third looks at the food offerings, mostly to try to figure out what the foods where. Animal, vegetable, mineral? I didn’t end up trying any of the strange goods but mostly because the lines for the items I thought I could stomach were too long. It was a fun and interesting experience. The few hutongs I strolled through were much more peaceful. Per Wikipedia, hutongs are ancient neighborhoods, some several hundred years old, with narrow streets or alleys commonly found in northern China, particularly in Beijing. Following the founding of the People’s Republic of China in 1949, many of the old hutongs of Beijing were replaced by wide boulevards and high rises. However, many of Beijing’s ancient hutongs still stand, and a number of them have been designated protected areas, offering a glimpse of life in the capital city as it has been for generations. It was great to walk down the quiet, narrow streets and alleys, passing local residents going about their day. While I explored some of the sights of the city, I spent much of my time in Beijing relaxing. After moving all over China for almost two months, I was happy to stay “home” for a few days, write in my journal, catch up on my favorite TV shows via the Internet, and relax. Thankfully, Gabriel and Sujin, being travelers themselves, understood and didn’t mind me chilling at their cozy apartments while they were at work. Two days before my flight out of China, I finally visited the Great Wall of China. Of course I was not going to leave Beijing without seeing at least a section of this historic site. Per Wikipedia, the Great Wall is a series of fortifications made of stone, brick, and other materials generally built along an east-to-west line across the historical northern borders of China. The Wall also includes watch towers, troop barracks, garrison stations, and signaling capabilities through the means of smoke or fire. Along with providing protection against raids and invasions of various nomadic groups and control of immigration and emigration, the Wall also allowed taxation of goods transported along the Silk Road. While several sections were built as early as the 7th century BC, the majority of the existing Wall is from the Ming Dynasty (1368–1644). The Ming walls (including the actual wall, trenches, and natural defensive barriers like hills and rivers) measure 5,500 mi (8,850 km) while the entire wall with all of its branches measures 13,171 mi (21,196 km). Wow! Brett, Laura, and I took a 1.5-hour bus to the Mutianyu section of the Great Wall. This is one of the closest and most accessible sections from Beijing which would typically make it one of the most crowded sections. However, since we opted to visit the Wall on a day forecasted for rain, we were pleasantly surprised by the relatively low numbers of fellow tourists. After walking past the gondola and instead ascending the 4,000+ steps (no, really! ), we stood on top of the Wall where we overlooked miles of lush, green forest. At this section, the Wall is primarily granite and is roughly 26 ft (8 m) high and roughly 16 ft (5 m) wide (per Wikipedia). Much of this section has been restored but continuing along the Wall and up and down hundreds of more steps, we were able to visit unrestored sections as well. It was really cool to see the difference between the restored and the crumbling unrestored sections. It was only by standing on the Wall and looking out at its meandering path up and down the forested hills and valleys that I finally got a sense of its massive scale. It’s amazing to think that anyone could have penetrated such a structure. On my last night in China, I met Brett and Laura for our last dinner together. We were joined by Victoria and Brett, an American couple we’d met on the bus from the Wall back to Beijing. After peaking through restaurant windows for a bit to try to gauge the quality of the food, we finally settled on a place that looked good. Since crossing the border into China almost 2 months earlier, Brett had been talking about eating Peking Duck and I’d totally gotten on board with giving it a try. Per Wikipedia, Peking Duck is a famous duck dish from Beijing that has been prepared since the imperial era. Once slaughtered, the whole duck is seasoned then roasted in a closed or hung oven. The meat is prized for its thin, crisp skin, with authentic versions of the dish serving mostly the skin and little meat, sliced in front of the diners by the cook. The meat is eaten with scallion, cucumber, and sweet bean sauce with pancakes rolled around the fillings. The duck was served to us in four ways: a plate of sliced meat with the skin, a plate of meat without skin, a plate of deep fried bones, and a bowl of duck soup. I’m not a big fan of duck meat but the meat was tender and delicious and eating it Peking-style in a pancake with the traditional filling was a must. Having a delicious traditional meal with friends was a fantastic way to end my visit. My experience in China was educational, interesting, and fun. Overall, I found the Chinese people I encountered to be friendly and helpful. It’s amazing how a smile can make strangers into friends. Many people were also very inquizitive, openly staring at me and my friends, and grabbing us enthusiastically to take pictures with them. I felt like a celebrity (or an alien), which was at times annoying but mostly funny. (I wonder how many pictures of me with strangers are posted on Facebook?) I was also blown away by China’s beauty, from the snow-covered mountains, tall karst and rock formations and deep river gorges to the lush rice terraces. China truly has some unique and mystical landscapes. My experience was made even more memorable by the wonderful people, Chinese and fellow travelers, with whom I shared it. I’m especially thankful to my good friends, Brett and Laura, with whom I shared many wonderful adventures with during our time traveling together. I hope we can explore some other parts of the world together in the future. About to ride around the lake with Laura & Brett in Dali. With Charlie, Nell, Laura, and Brett in Chengdu. With friends from Zhuo Yue English College, Yangshuo. With Carla, Alba, Tal and friends in Hangzhou. With Sujin, Michelle, and Vivian in Beijing. With Laura and Brett at an unrestored section of the Great Wall.